The MSC Meraviglia will introduce you to a new-era of design and technology with spectacular entertainment options. The MSC Meraviglia is the first of its kind, being the first ship built in its class its sister ships will be all built by 2020 & a new-era of cruise ships will be born. This new cruise ship will be able to dock at any port around the world which will offer a greater variety to its itineraries and destinations. The MSC Meraviglia will offer a wide range of entertainment areas like two promenades that will be covered with LED screens that will be able to transmit sunrises, sunsets and starry skies. It will also offer fun and exciting water parks for both children and adults, bowling and a state of the art gym and fitness center. You will also be living in stylish cabins no matter what the type. 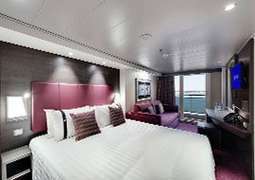 With suites, balcony, inside and outside cabins available you can have your choice of cabin types. 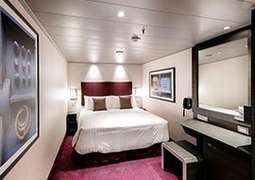 The ‘MSC Yacht Club’ will be expanded onboard the MSC Meraviglia and as a member you can choice a ‘MSC Yacht Club’ room with an exclusive 24-hour butler service and a dedicated concierge. 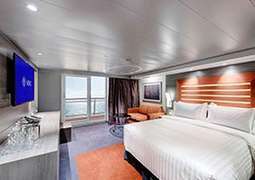 Meraviglia will offer a wide variety of cabins to suit all of her guests. Family cabins are available which will accommodate up to 10 people comfortably and consist of two or more connecting cabins, each with its own bathroom. The Yacht Club experience offers a luxurious and elegant stay for those who wish to relax and rejuvenate, with 24-hour butler service and exclusive services available. 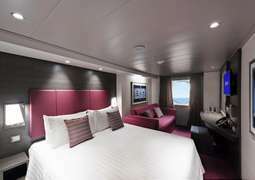 Each cabin from Inside to Outside, Balcony to Suite, offers an enjoyable and comfortable escape to relax. There are 12 different dining options available onboard, ranging from Italian cuisine to American-style food to traditional Asian recipes. The main restaurants offer a wide variety of freshly prepared food in elegant surroundings. 'Eataly - Ristorante italiano' serves a variety of Italian dishes and allows you to learn about Mediterranean cuisine. For those looking for an excellent meat-based meal, the 'Butcher's Cut' serves prime cuts from around the world paired with wines and cocktails. 'Kaito Teppanyaki' offers traditional and authentic Asian cuisine in a modern setting. The 'Marketplace Buffet' is open 20 hours a day and offers food for every dietary requirement suitable for families, those looking for a traditional meal or healthy options. From bars and cafes, to theatre performances and water parks and more, there is no lack of amusement and entertainment onboard the Meraviglia. Enjoy an enormous choice of champagnes and other sparkling beverages in the 'Champagne Bar', attend a Cirque du Soleil performance in the 'Carousel Lounge' every evening or join your other guests in the 'Edge Cocktail Bar' for a freshly made drink at any time of day. For children and teenagers, there are specially designed areas just for them. A teens-only area offers a cinema, gaming room and disco, while the younger children can play in their dedicated rooms. The 'Polar Aquapark' is one of the most exciting and thrilling water parks at sea suitable for every guest, while the 'Horizon Pool' and 'Atmosphere Pool' offer a more tranquil and relaxed atmosphere during the day, and a thrilling dance area at night. Meraviglia also offers a chance for her guests to relax and pamper themselves at the 'MSC Aurea Spa', where they can luxuriate and revitalise themselves with the thermal area, beauty salon or nail boutique. For those wanting to energise, the MSC Gym is equipped with state-of-the-art cardio and strength equipment, as well as offering a wide variety of fitness courses and training programmes so that all guests can feel their strength and power. The 'Galleria Meraviglia' is a 96 meter long promenade filled with boutiques, restaurants, and other shopping opportunities. The ceiling of this promenade s the largest LED dome at sea, allowing for a digital sky that can show sunrises, sunsets, stunning vistas and more.